Let us start with knowing what is AngularJS? AngularJS is an open source framework maintained by Google to address the challenges faced by the developers while developing and testing the code. AngularJs integrates HTML codes and application modules forming a framework. It is based on the Model View Controller (MVC) Architecture which ordinarily utilized for planning rich web applications. Since the introduction of the Angular 2, the new and improved features of Angular technology have assisted the AngularJS Development Services with a boon. It can naturally synchronize with models and view making AngularJS development a simple procedure. So to put it plainly, Angular JS's features are – Two-way data binding, MVC structure, directives, templates, dependency injections and testing features. Lesser coding only required and hence developers can focus more on the efficiency of the application instead of writing just codes. Once the feature has caught is the developer’s mind, it is easier to put code lines and give better results for your business. It is an important feature and pulse point of AngularJs framework. Works well with testing and Single Page Application Design. When the data is moved between the model and view the synchronization is handled between the DOM and the model efficiently. 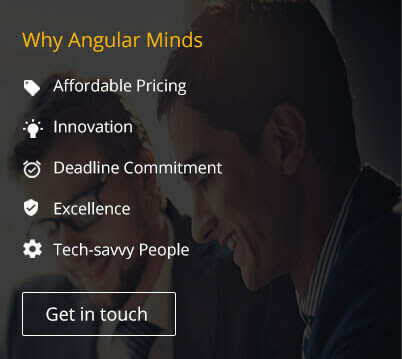 This helps the AngularJS Development Company to build web applications with ease. Thus data binding is one of the most impressive features of AngularJS Technology. Model-View-View –Model Architecture supported by the AngularJs is one of the contemporary web development processes. POJO Models work closely with the views and controllers. AngularJs reduces code and does not require Getter and Setter functions. The edits in the models can happen on the POJO directly and it loops over objects and arrays. Because it supports caching and many other processes, Angular reduces the burden from server CPUs. It means that the server performs extremely well thanks to reduced traffic and because it only serves static files and responds to the API calls. Provides support to both end-to-end and unit testing. The testing is made easy and flexible at any level of development. Have great testing compatibilities. AngularJs handles dependency which is coupled with the MVC Architecture allows developers to develop in a parallel way. This is the feature where AngulaJs overshadows other frameworks. Directories give the developers a free hand over the HTML and attributes which give them complete independence to develop dynamic web pages. The AngularJS manages the application’s properties, permissions, and other attributes are the best manner possible. The Application states whether being in any illusion or in disillusion status. Everything is well managed here. It provides all the win-win benefits to the AngularJS Development Services with all its efficient features and productive methods. AngularJs Developers are catered with the smooth web application development framework which allows easy and effective web application development.